So a couple weeks back I went on this total gold kick. I just wore one gold polish after another. This included gold polish on top of other polishes. It was weird. I've never experienced that before. I usually get sick of a colour and move onto something else. So yes, this is one of those golds. 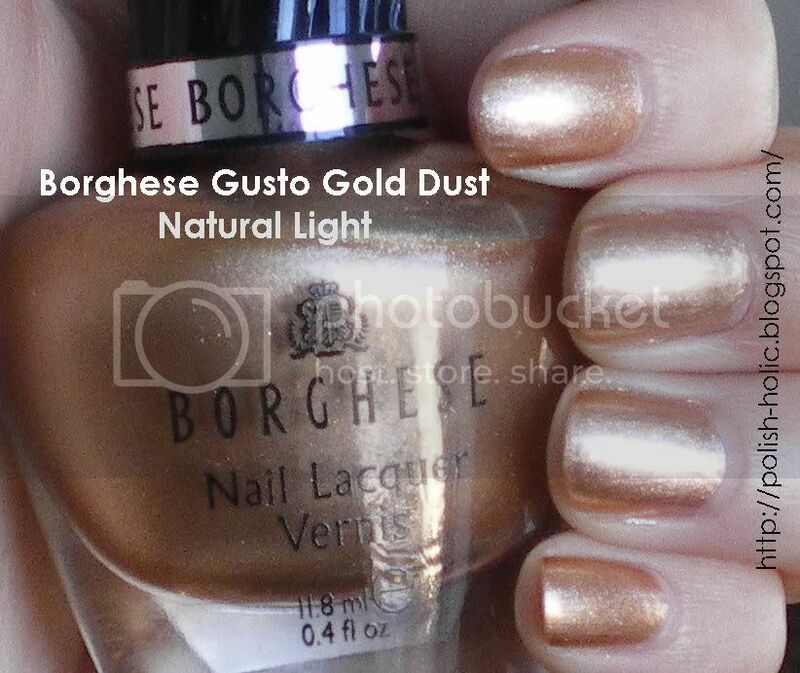 My first ever Borghese. They have such lovely bottles, but man are they ever pricey. And I totally think of them as a drugstore brand since the only place I've ever seen them is Shoppers drug mart. But this little beauty was on sale and it is joy in a bottle. 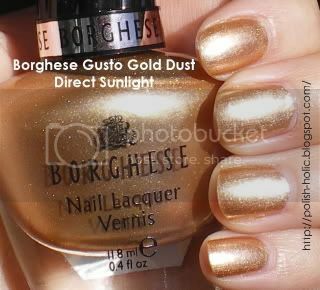 Gusto Gold Dust is a gold foil. Or that's what I think of it as. It has silver glitter which is great because it moves it from a warm polish to a neutral. I love how it's such a deep gold colour, but not intensely yellow. This is two coats. The formula was good, no streaks, no complaints. But boy, oh boy, do I have complaints about the brush. That sucker was huge. This brush makes Sally's Insta-dries look petite and reasonable. I'd understand wide, but not the thick part. Jeebus. A brush does not need to be that obese. Please Borghese, you'd save money on bristles if you'd just cut it down a little bit. Other than the brush, I would really recommend this polish for all gold lovers out there. This was part of the 2009 holiday collection, if I recall correctly. Remember! Giveaway at 100 followers! That is a stunning gold!!! Isn't it?! I love it. Wow, that looks amazing. I'm on a gold kick, too. OPI Dazzled By Gold started me on it. Have you tried the Nina Ultra Pro Velveteen Rabbit? I love that one. I was looking at that last week. Do you think Sally would still have it?